On April 16, Lucy del Carmen accepted the Kuyper College Service Award—for both her own service and on behalf of her late husband, Vincente Apostol (also known as Vince). Lucy and Vince were the first missionaries to serve with Resonate Global Mission (then Christian Reformed World Missions) in the Philippines. The award, presented by Kuyper College in Grand Rapids, Mich., goes to those who “demonstrate a dedicated vision and commitment to sharing the love of Christ, the encouragement of his Word, and the hope of his presence in every square inch of God’s kingdom,” according to Kuyper. Vincente and Lucy both attended Kuyper (then Reformed Bible Institute) to gain ministry skills they would later use back in their home country of the Philippines—Vince as an evangelist and church planter and Lucy as a nurse and teacher. The couple retired from work with Resonate in 1996 and Vince passed away in 2007. Still, as this honor from Kuyper College indicates, the Apostol’s legacy of service continues to inspire others to serve in mission throughout God’s kingdom. Both Vince and Lucy emphasized a life of service to their children. Even to the point where Lucy gave away her son’s favorite shirt when she saw another young boy who needed it. Today many of Lucy and Vince’s family members continue to serve in the Philippines, and many of them also attended Kuyper college. Lucy’s sister, Glenda, along with her husband, served in the Philippines with the Luke Society. The Apostol’s son, John, serves in a Christian Reformed Church in the Philippines (CRCP) in Manila. Their daughter, Faith, met her husband, John, while John was doing ministry in the Philippines. Their daughter, Lori lives in Bacolod City and actively serves in her local CRCP church. Finally, their granddaughter, Valerie, aspires to serve abroad as well. As a result of his church planting efforts, today Vince is known as the “father” of the (CRCP). His and Lucy’s service opened the door for more than 50 years of church planting and discipleship ministry in which 85 Christian Reformed expatriate missionaries served with Resonate in the Philippines—many of whom were mentored and introduced to Filipino culture by Lucy. Resonate gradually drew down the number of missionaries in the Philippines, and today Filipinos are now at the forefront of ministry. The CRCP now sends missionaries and church planters of its own, demonstrating the global impact of Lucy and Vince’s ministry. One such missionary is Ronnie Lopez, who first met Vince about 50 years ago and later attended a CRCP seminary. 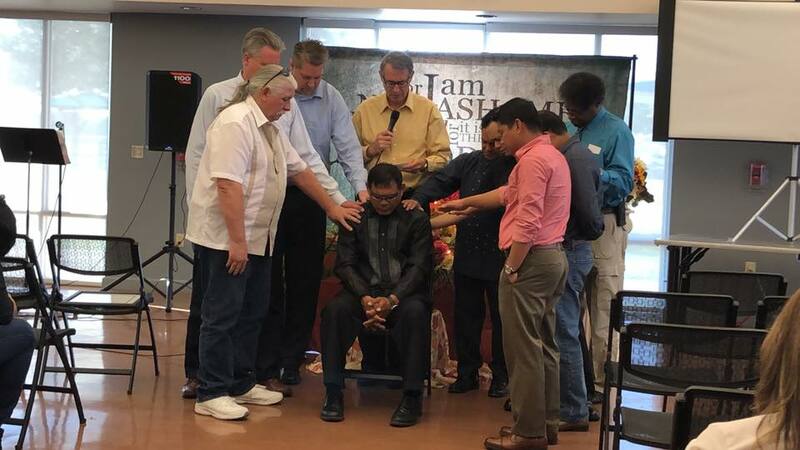 Today Lopez (pictured at his ordination service) shares his passion for sharing Christ’s love with fellow Filipino immigrants in the Houston, Texas, area, partnering with Resonate and New Life CRC (Spring, Tex.) to plant a church. “I think people see themselves becoming more aware of their relationship with God and their status in Him,” says Lopez, joyfully reporting on the church plant’s progress. “And because of that, they are becoming more familiar with the gospel and are more willing to share it.” (Read more of Ronnie's story here). When you pray for and give to Resonate ministries around the world like the Apotsol's, you are fueling a mission that echoes from everywhere to everywhere. You are entrusting the gospel to missionaries, church planters, and ministry leaders who teach others to grow the church. Thank you!